Last week, I spoke to a class of 100+ new medical students at their orientation. This is the class of 2016 and I had 60 minutes to talk to them about health care quality. Last year was the first time I did this - talk to students even before they started medical school about the imperative for doctors to not only continually and critically look at and improve their care, but also to pay close attention to the system of care around them. Last year's talk was different. I thought that students would find the science of improvement intriguing. After all, these students loved and excelled in science, and were obviously highly organized, which is why and how they were here. So I spoke about Plan-Do-Study-Act cycles, Lean, Six Sigma and control charts. If this was not enough, I also spoke about process mapping and data-driven care. But I perceived that my own enthusiasm was not exactly contagious that day in the room. Thinking more about what I should focus on during this year's hour on quality improvement, I realized that these young students, at the average age of 23, did not decide on medicine as a career because they were excited about processes or data or systems. They were here most of all to help people, to listen to patients' stories, and to heal. So this year my talk was different. It was called "First do no harm" and it centered around a story that is now more than 10 years old, but still teaches us so much about the fallibility of clinicians and our responsibility to do more. 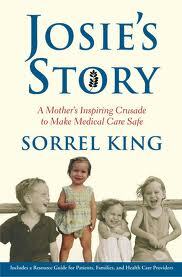 The Josie King Story, a video of a mother speaking at a conference about her daughter's death, brings a lump to my throat as many times as I see it. This was the first time I had shown the video to such a large class of students. As I scanned the room after the video ended, there was hardly a dry eye in the room. Josie's mother, Sorrel, spoke about her daughter's death and the series of system failures that led to a breakdown of her medical care during her hospitalization. She spoke about communication and patient-centered care (or lack thereof). And of looking back to learn, but then focusing on looking forward to improve. She spoke about proactively putting in systems of care to prevent failures in care from ever occurring again. This is the message we want future doctors to hear. The message that they are fallible and will make mistakes. But that there are ways to mitigate and even prevent such errors from happening if they only keep their minds and hearts open and listen to their patients. The National Health System (NHS) in the UK has used patient stories to inspire their clinicians to improve their care. The NHS uses "Discovery Interviews" to gather patient narratives to inform quality improvements, and to understand what really matters to patients and their caregivers. This year we implemented an innovation in our curriculum for first year medical students. As part of their home visit program, students asked patients about their experiences with the health care system and patients' ideas on how we could improve their care. Our goal is not only for students to learn from patient stories, but also for us to share these stories and ideas with our quality improvement department and committees to inform change. If you pick up the August 2012 issue of Consumer Reports you might get to check out just how safe your local hospital is. The magazine has published safety scores for 1159 hospitals in 44 states based on rates of infections, readmissions, communication with patients, CT scanning, complications, and mortality. Hospitals were scored on a 100-point scale. More than half of hospitals received an overall safety score below 50%. All hospitals had quite a way to go to make their care stellar. The best performing hospital, Billings Clinic in Montana, received 72 points. The worst performing hospital, Sacred Heart in Chicago, received 16 points. Most hospitals fared badly due to two systemic issues - those related to readmissions and communication. There are some obvious issues with rating hospitals. One source of information before the Consumer Reports rating was The Leapfrog Group's controversial scoring system. This system grades hospital safety using a letter grades from A through F, much like a report card. Comparing Leapfrog and Consumer Reports scores can result in sometimes significantly different ratings. For example, Massachusetts General Hospital received an A from Leapfrog, but earned a score of 45 from Consumer Reports. Consumer Reports advises its readers that to get a complete picture, they should use their ratings along with others, such as Hospital Compare and those published by Leapfrog. Consumers also need to take ratings, grades and scores at face value, keeping in mind the context these hospitals operate within. For example, many highly-regarded hospitals scored low in the area of safety: Mass General (score 45), Ronald Reagan UCLA (score 43), Cleveland Clinic (score 39), Mount Sinai (score 30). But these hospitals look after a large number of patients with limited ability to receive follow-up care - the poor, the uninsured, those suffering from substance abuse or mental illness - increasing their hospital's readmission rates. Some of these hospitals also tend to take care of more non-English speaking patients which might affect their scores on communication. Consumer Reports ratings currently include only 18% of hospitals in the US, since such data aren't publicly reported fully or consistently by all hospitals. In the end, transparency is what it's all about. If I cross-check Yelp and the Davis Wiki before eating out at a restaurant, I suppose it is not such a bad thing to have more than one source available when checking out my medical care.